Club Couture™ is an exciting opportunity for my customers to subscribe and receive an exclusive Chalk Transfer™ design and three coordinating Chalkology™ Paste Singles every month for just $19.99! Scroll to see the latest Transfer of the Month . . .
What is included in Club Couture™? • An exclusive B-sized Transfer that is designed to be right on trend, in season, and one of our hottest styles—but you can’t get it ANYWHERE but Club Couture. Retail value is $14.99. • Access to the how-to project video and instruction sheet (printable PDF), emailed to you each month. • Special offers and deals: for example, Club Couture members are the only customers who will be offered opportunity to purchase past favorites from the program, order the discounted Kickstart Kit, or participate in special discounts, bounce back, or other secret sales available only to participating subscribers. 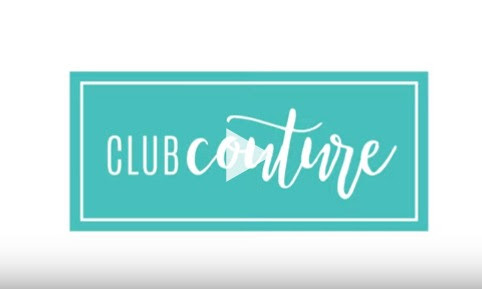 Click below to play a short video that explains a little about the NEW Club Couture program! How can YOU subscribe to Club Couture? You can visit The Junky Chalker and select the “Club Couture” tab at the top navigation bar. This page allows you to enroll in the subscription. Initial enrollment requires a 3-month commitment. You won’t pay for the subscription at checkout but will provide your credit card information. You will be billed $19.99 on the 5th of each month. If the payment is processed successfully, the subscription box will ship the 5th of the month. After the initial 3-month commitment, you will continue to be billed $19.99 per month and may cancel any time. If you cancel and want to re-enroll, you will need to sign up for the initial 3 months again. For example, if you want to subscribe and join on my Chalk Site on February 16, your card will be billed on March 5. Your March Club Couture subscription will then ship on March 5. Your card will automatically be charged again on April 5, May 5, and so forth as long as you’re a subscriber. If you cancel on June 5, you will not be charged for a July subscription nor receive your Club Couture box for July! Can I add anything to my initial subscription purchase? Yes. In addition to the subscription, new members may also purchase the current month’s Club Couture Transfer (if inventory is available) and have it shipped immediately for $19.99 (plus shipping). Additionally, you can also purchase a Kickstart Kit to get started with your first ClubCouture project. The Kickstart Kit is $69.99 plus shipping—see below for a list of what’s included. The current month’s Club Couture Transfer (while supplies last) and the Kickstart Kit are only available for purchase at the time of enrollment. Both items are billed and shipped immediately and have regular shipping charges included. For example, if you order the Kickstart Kit when you enroll for Club Couture, but the February Transfer is sold out, the Kickstart Kit and any additional product ordered ships and bills immediately. The March subscription will bill on March 5 and ship on March 5 as described above. Note that if you enroll for Club Couture and do NOT add the Kickstart Kit or the current month’s subscription box to you order, you will NOT be able to order it later. It can only be purchased when a Club Couture subscription is part of the order. Relatedly, if you add a Club Couture membership, a Kickstart Kit, and the current month’s subscription box to your cart, but then remove the membership before checkout, the other items will also be removed. It cannot be purchased without a successful enrollment. You can visit The Junky Chalker and select the “Club Couture” tab at the top navigation bar. What is included in the Kickstart Kit? The Kickstart Kit is a product pack to help get you ready for your first Club Coutureproject and any project from there on out for just $69.99. How much is shipping for Club Couture every month? Club Couture subscriptions include FREE shipping! Sign up here: The Junky Chalker and select the “Club Couture” tab at the top navigation bar. What if I want to cancel my Club Couture? You may cancel any time after the initial 3 months . In this unlikely event, you must cancel by the end of the month. Cancellations between the 1st and 5th of the month are too late to honor for that month’s shipment and the enrollment will end after that shipment. B Transfer and 3 Paste Singles (.19 fl. oz.) colors included are Couture Teal, Peacock, and Bumblebee.